Every career has a pivotal moment. For Michael Marino, it was a lunch meeting with the CEO of St. Joseph Health four years ago, during which she asked if he wanted to serve as CMIO. Marino, then CMO at St. Jude Medical Center, knew it wouldn’t be easy; the system was using nine different instances of Meditech. But he accepted the challenge, and now he faces another in leading St. Joseph through the merger with Providence that become official last summer. In this interview, Marino talks about having an “evolving” IT governance structure, the work they’re doing with predictive analytics, why leaders can never stop learning, and the fine line CIOs must walk in balancing consumerism with the burden placed on clinicians. Consumers just don’t want the Marcus Welby experience anymore. They want care where they want it, when they want it, how they want it. You can’t do it one way. And so we have to make sure we have the technologies to support that. It’s much different to manage that relationship and work with a behemoth like Epic or Meditech that’s very structured. You’ve got to be agile and be able to work in both spaces if you’re going to be in leadership in IT these days. The science is getting pretty sharp, but what do you do with that crystal ball experience if you don’t know what the intervention is? Do you really want to know that you have an 85 percent chance of having a heart attack in the next months if the doctors don’t know what to do to keep it from happening? If I went into a room with 50 directors of emergency departments and asked what’s your one wish, it would be having psychiatry when they need it. The push from the marketplace is to get more and more data from the consumers and respond to the consumer need. But if you don’t care for and feed the core people doing the work and respond to their needs, eventually, you’ll have a revolt. You’ve got to feed and water the horses. Gamble: What would you say are the biggest priorities on your plate looking at 2017? Marino: You can put them in two buckets. We have the core things that we need to do from an integration standpoint because of the merger, but more importantly, the technology space is rapidly changing. We’re looking at innovation partners where people have been using the EHRs now, depending on the hospital, for 10 years. That’s great, but people need other things to change the care. And at the same time, consumers just don’t want the Marcus Welby experience anymore. They want care where they want it, when they want it, how they want it. You can’t do it one way. And so we have to make sure we have the technologies to support that. For example, patient engagement platforms that expand on the original portal idea that was an MU driver — telehealth that is both physician to physician and consumer-driven, and being able to do something that sounds simplistic in every other part of the world except healthcare: scheduling online. I change my flight on the fly in the airport on my cell phone, but I have to wait on hold to go see my PCP once a year. Marino: So we’re working the merger, but at the same time working all those different fronts to truly change healthcare to enable it to evolve, and we’ve got to do all that at the same time. I think the interesting thing for leaders in informatics these days is not only do you get to deal with core companies like Meditech or Epic that have been in the space for a long time, but you’re dealing with startups and trying to manage those relationships. St. Joe’s has a couple of investments in small companies and is partnering with them. 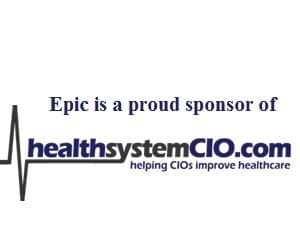 It’s much different to manage that relationship and work with a behemoth like Epic or Meditech that’s very structured. You’ve got to be agile and be able to work in both spaces if you’re going to be in leadership in IT these days. Gamble: That’s interesting. It’s something we’re definitely hearing more about. Are you talking primarily about innovation partners? Marino: Yes, and it’s a different expectation, because sometimes you’re investing in those, sometimes you’re not, but they’re much newer in the space, so a lot of times you’re helping them, versus when you go to IBM or Meditech or Epic. In that case, you’re just buying something and they’re delivering something that they deliver to a hundred other people. Gamble: So the organization doesn’t shy away from working with startups even though, like you said, it is a very different experience. Marino: No, we’ve definitely not shied away from it. Gamble: Okay. Now as far as things like predictive and prescriptive analytics, I imagine that’s something you’re either working toward or really looking at very closely. Marino: Prescriptive, I think, is still evolving. In terms of predictive analytics, we’re actually doing pilots with two different companies that are about to launch this month. It’s been interesting because in healthcare — and at St. Joe’s, in particular — we’ve spent years gathering data and sitting it in big data farms, data lakes, whatever word you want to use, but we haven’t done much with it other than core finance things or simple clinical things. So we’re partnering with predictive analytics companies that have their own social databases and will apply your data up against that to try to differentiate social determinants of health like how do things map in your community, and is the likelihood of being readmitted different in one neighborhood versus another. I think that’s exciting. It’s what people expect because that’s the big data experience you get everywhere else. If you search something on Google and you’re an Amazon Prime member, Amazon will try to sell it to you the next day. Gamble: Yeah, that’s very effective. With the pilots, are you looking at certain disease states or certain patient populations? Marino: With the one company, we’re looking at trying to predict whether somebody is likely to code or deteriorate. That’s the sicker part of our population in the hospital. The other company, the first pilot, is looking at predicting if people are likely to develop a pressure ulcer. Because when you’re in the hospital, we do the normal interventions so that you don’t end up with a bed sore. There are lots of fancy interventions you can do, and you want to make sure you’re applying those interventions to somebody who’s at risk but not to everybody, because some of them are annoying. As an example, you don’t want to be on a pressure-changing mattress if you’re not at risk for a pressure ulcer, because it’ll disturb your sleep. But if you’re likely to get a pressure ulcer — which is devastating to the patient; it’s a horrible experience — maybe it’s okay if we mess with your sleep a little bit to save your skin. Gamble: That is really exciting. One thing that I can imagine might be a challenge for leaders is to really be able to temper expectations somewhat of clinicians who really want to push forward and be able to get these benefits of all the data that’s been collected. Is that the case? Marino: Yeah, and I think the clinicians are a little tired of the experience. We’re constantly saying we’re going to use the tools, but we’ve been collecting data for years and haven’t. This is the first time we’ve delivered something to the bedside, and we did a lot of due diligence trying to decide what to do. I’ll give you an example. With the one company, I had a conversations with colleagues that had used the company, which is called Jvion. They’ve got some interesting models. One of them literally predicts with pretty good certainty whether you’re at risk for a heart attack in the next six months. I talked to a colleague at the University of Mississippi who used it and tried to apply it. The difficulty is there’s no science about what the intervention is, so it drove the patients and the clinicians crazy. The science is getting pretty sharp, but what do you do with that crystal ball experience if you don’t know what the intervention is? Do you really want to know that you have an 85 percent chance of having a heart attack in the next months if the doctors don’t know what to do to keep it from happening? Marino: There are a lot of doctors running around putting people on medications and taking them to the cath labs, but none of them were definitely a prevention for this overall prediction. It’s an interesting space right now. You want to be in it, but you don’t want to know something’s going to happen that you can’t fix. Gamble: And it’s understandable, like you said, how physicians have been hearing about this for a while and changing their workflows, so now they want to take that next step, but it has to be a deliberate process. Marino: Right. You want value, right? I’m asking them to check boxes or use certain language so it’s capturable and codable with the promise of being able to change care. They’re just getting a little tired of us crying wolf. Gamble: I’m sure you can understand that being a physician. Marino: Yes, which is nice, because then I can commiserate. Gamble: Sure. One other piece I had seen was the Mental Health Initiative, which was really interesting and something the industry has been calling for more with better access to mental health services. That seems like really a step in the right direction. Marino: I think it’s exciting, and it’s a great goal. We’re tackling it on two fronts. On the technology side, it is one of the major parts of our telehealth offering between ourselves and Providence to enable remote psychiatry in places that don’t have access to mental health providers, because that is a growing concern. If I went into a room with 50 directors of emergency departments and asked what’s your one wish, it would be having psychiatry when they need it. Because most hospitals — even in suburban Orange County in Southern California, which is a very affluent place where you would think it would be easier to recruit doctors — don’t have psychiatrists. On the other hand, a lot of what we’re doing is trying to partner with people and think about how you change that space, because although everybody knows it’s a need, I don’t think we have great tools or solutions to be able to actively affect the population. A lot of what we’re trying to do is bring people together and have the conversation and be able to support pilots or interventions in that space beyond the traditional way, because just having more psychologists, psychiatrists, social workers and put them in old-fashioned care models — we’re too far past that. It would take too long to train people up into that space. How do we do things in a unique way is what we’re striving for. Gamble: Right. So obviously you have a lot going on with the organization in what’s a really exciting time. Looking back now at that offer four years ago to accept the CMIO role, was it the right move? Are you glad that you took that step? Marino: Oh yes. It’s been a great ride, and it hasn’t slowed down since. Gamble: All right, just the last thing I want to get your thoughts on is where the health IT industry is compared to two or three years ago. Looking at the different direction it seems to be taking, do you feel like we’re moving in the right direction? Marino: I think trying to be able to support different initiatives is key, because that’s the consumer expectation. The one gap I worry about is if you look at physician and nurses’ satisfaction or burnout rates in the US, it’s really high — more than 50 or even 56 percent, depending on whose study you look at. And the number one complaints are EHRs. We push people into the transactional part of IT. We really need to step up in the near future with the promise. The example I always use is that it used to take me 90 minutes to pay bills every month, to write checks. It now takes five minutes, and I can carry on a conversation as I’m clicking through Wells Fargo online. I’ve been a physician for 25 years now. I used to be able to fill out documentation for a hospital visit or a clinic visit (I’m a pediatrician) in minutes. That same transaction in EHR — it doesn’t matter who the vendor is — takes two or three times that long. It’s been the only application of technology that’s added time to an experience. Technology has improved most experiences. If we don’t start delivering on that, I think we’re going to have a revolt with clinicians in the very near future. Gamble: Any advice for CIOs — especially CIOs who don’t have a clinical background — on how to be aware of this and take steps to ease that burden? Marino: I think that the push from the marketplace is to get more and more data from the consumers and respond to the consumer need. But if you don’t care for and feed the core people doing the work and respond to their needs, eventually, you’ll have a revolt. You’ve got to feed and water the horses. You see people just driving more and more stuff and it’s like, you’re going to break the system. You have to balance responding to the consumer and caring for the providers that are taking care of the consumer at the same time, or it’s going to break. Gamble: That’s a really good point, and really something to take to heart. Well, I know you have a lot going on. I really appreciate your time and I think your perspectives are going to be really beneficial for our audience, so thank you. Marino: Great, thank you so much for taking the time. Gamble: Sure. I hope to speak with you again.